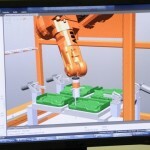 Automation Technology – Custom-Pak, Inc.
Custom-Pak Blow Molding Automation Technology Center designs and manufactures integrated robotic and automated work-cell systems. These automated systems work in harmony with our blow molding machine controls and secondary operations equipment. 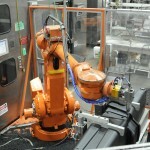 The automation team provides fast, accurate and repeatable equipment for a variety of operations. Part removal robots eliminate repetitious or strenuous work. Customized fixture nests precisely secure each part. Robotic programs include touch sensitivity and vision logic for incredibly precise secondary operations, assembly or beautiful decorating. Laser or vision based final inspection and accurate systems for pack-out of complete blow molded products yields 100% satisfaction. 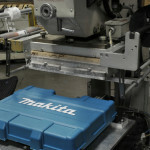 Much of our blow molding automation equipment is provided at no additional cost and the benefits are truly fantastic.